The 80s pop duo Dollar consisted of David Van Day (who appeared on Coach Trip in 2010 and I'm A Celebrity Get Me Out Of Here in 2008) and Thereza Bazar. The duo enjoyed success with ten Top 40 singles (mostly lightweight pop) between 1978 and 1988. Released in 1978, Shooting Star was Dollar's debut single, reaching #14 in the UK. It took a while to get there, although back in the 70s and 80s many songs would take many weeks, if not months to reach their highest chart position. Both David Van Day and Theresa Bazar first met when they successfully auditioned to become part of the 70s pop group Guys 'n' Dolls. The group had numerous chart hits including "There's a Whole Lot of Loving" and "You Don't Have To Say You Love Me" which both reached the UK top 5. In 1977, Van Day and Bazar left the band and went on to form Dollar. 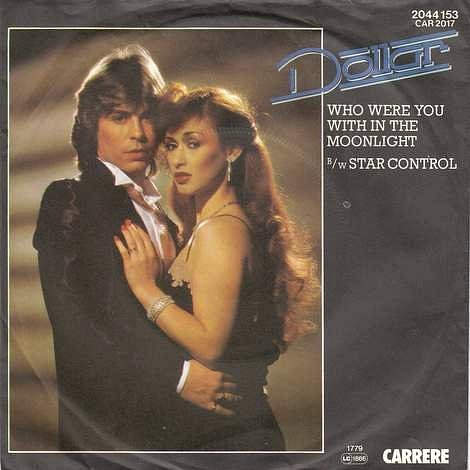 Released early in 1979, the duo's follow-up single Who Were You With in the Moonlight? also reached #14 in the UK singles chart. Once again, Van Day provided lead vocals, but on the duo's third single release, the self-penned Love's Gotta Hold On Me, it was the turn of Bazar to take the lead. This became Dollar's highest-charting single of the 70s, peaking at #4 in the UK and also #12 in Ireland. After three successful singles, the duo decided to release their debut album, Shooting Stars, although it only managed to reach #36. Indeed, none of their album releases were particularly successful and they remained very much a singles pop act. There was a change of tempo for Dollar's fourth single. I Wanna Hold Your Hand was, of course, originally a hit for The Beatles and penned by Lennon-McCartney. Dollar's cover version reached #9 and was the duo's fourth single release. Initially, the song didn't feature on their debut album Shooting Stars, but was included on re-releases of the album. At around the same time, the duo also released their "Shooting Star" single in the U.S. which became their only first (and last!) U.S. hit, peaking at #74. After a successful run with the Carrere record label, the duo signed to WEA records in 1980. With the success of their self-penned hit Love's Gotta Hold On Me still firmly on their minds, Van Day and Bazar took the decision to write all of the tracks for their second album, The Paris Collection. They decided on a more rock-orientated sound which, unfortunately, didn't go down well with the record buying public, and the album failed to even chart. All of the three singles released from the album - The Girls Are Out To Get Ya, Takin' a Chance On You and You Take My Breath Away were flops, with only Takin' a Chance On You entering the UK singles chart, peaking at #62. Following their huge decline in popularity, the duo announced their engagement, although this was viewed by many as a publicity stunt and a desperate attempt to revive their pop career. Indeed, it was later revealed that it was actually a PR stunt - naughty! Having previously met producer Trevor Horn during her time in Guys 'n' Dolls, Theresa Bazar approached him to ask whether he would produce their third album. He took her up on her offer and Dollar developed a new, distinctive and more polished sound which helped to save their flagging career. Although not a massive hit, the duo's first Horn-produced single Hand Held in Black and White (their eighth single overall) still reached a credible #19, and, no doubt, the couple blew a huge sigh of relief. Released in November 1981, Mirror Mirror (Mon Amour) was a big hit over the Christmas period, reaching #4 in the UK and #5 in Ireland. 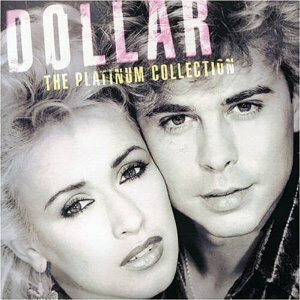 The track was the second single to be released from Dollar's third studio album The Dollar Album. The B-side, Radio, had previously featured on the duo's second album The Paris Collection. 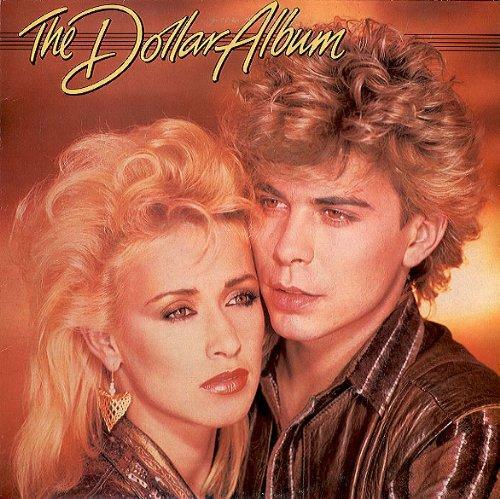 Early on in 1982, the duo's old label Carrere records re-released Dollar's debut album with the new title The Very Best of Dollar, which featured an extra track, I Wanna Hold Your Hand. In March 1982, Ring Ring was released as a single to promote the album, which peaked at #61 in the UK. Just a week after this release, WEA released Give Me Back My Heart as a single which reached #4. 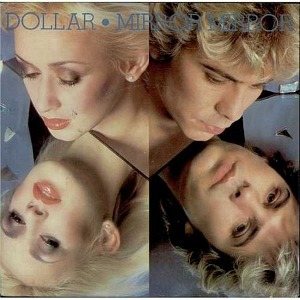 In October 1982, The Dollar Album was finally released and it became their most successful, reaching #18 in the UK. Not only did Trevor Horn help to revive the duo's music career, he significantly boosted his own, and quickly caught the attention of other 80s bands, more particularly ABC. Horn was now a very busy man, so much so, that he had no more time to work with Dollar. Because of this, the final single release from The Dollar Album, Give Me Some Kind of Magic, was not produced by Horn, although it still managed to reach #34 in the UK and #12 in Ireland. That's a cool-looking five o' clock shadow, Dave! With all the bubbles and fluffy clouds in this promo video, it's hard to believe that the cheesy 80s love song, Give Me Back My Heart, was produced by Trevor Horn. Remember, this was the same guy who went on to produce the controversial Frankie Goes To Hollywood. It was the duo's eleventh single overall. In February 1983, a promotional trip to Japan ended in a blazing row between David Van Day and Thereza Bazar. Van Day quit, and the single Two Hearts was never released. Van Day embarked on a solo career, releasing a single entitled Young American Talking which became a very minor hit, reaching #43 in the UK. He also released a solo single in 1985 called Ringing The Bell which also failed to chart. Bazar released an album, The Big Kiss with two singles. Costing around £500,000 to produce and market, the album was a flop. Apparently, MCA Records got into a mix-up with the release date and no albums were available to buy at the time of release! After being unsuccessful with their solo careers, Dollar decided to reform in 1986 and released four more singles. However, We Walked In Love could only reach #62 and Haven't We Said Goodbye Before failed to even enter the charts. In 1987, the duo decided to release a cover of the Erasure track Oh L'amour which became a top ten hit during 1988. The video clip in the playlist at the top of the page features a performance by Dollar of Oh L'amour on BBC Top Of The Pops in 1988, and they are introduced by Radio One DJ Gary Davies who is wearing a hat that should've been left in his wardrobe. The original Erasure version which was released in April 1986, only reached #85 in the UK singles chart. Amusingly, Dollar's version reached #7 in the UK and was the duo's last Top 40 hit single. Coming up with a successful follow-up created tension between Van Day and Bazar, and it took them six months to finally release a new single. However, six months is a long time in the pop industry and It's Nature's Way (No Problem) failed to chart highly, stalling at #58. 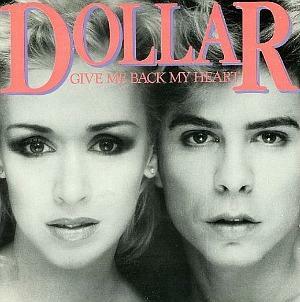 This was Dollar's final single, and by the end of 1988 the duo had split once again. Another attempt by Van Day at a solo career failed miserably and Bazar quit the music industry altogether, moving to Australia to raise a family. During the 1990s, Van Day set-up a touring version of Dollar with several female singer's taking the place of Bazar. Later on in the decade, he joined a new version of Bucks Fizz with original band member Mike Nolan. Confusingly, there were now two versions of Bucks Fizz touring the UK. Bobby G from the original band tried to sue Van Day in the High Court, but as Van Day had been touring for five years (and also running a burger van at the same time, much to the delight of the media!) the High Court could not grant an injunction against him. In 2002, Van Day and Bazar put their differences aside and ventured on the Here and Now Tour across the UK, alongside other 80s artists. In 2003, the duo appeared on a reality show called Reborn In The USA, in which old pop acts attempted to rejuvenate their careers by touring the USA. Each week they faced a public vote-off. On the show, they infamously had a blazing row with 80s pop star Sonia - I remember it well - and they were soon voted off. Dollar also appeared on Pop Goes The Band in 2008, which was also another failed attempt to rejuvenate their ailing musical career. After appearing on I'm A Celebrity, Get Me Out of Here in 2008, Van Day released the download-only single Biff Baff Boff with Timmy Mallett, which the duo had sung together on the show. Unsurprisingly, it failed to chart and Van Day's appearance on the ITV reality show upset Bazar who declared that she would never work with him again. On 15th Feb 2010, Cherry Red Records released expanded and re-mastered editions of The Dollar Album and The Paris Collection on CD. On 21st Feb 2010, David Van Day married Sue Oxley, a beauty editor for The Sun newspaper. They are currently living together in South Ockendon, Essex. After living with her two sons in Sydney, Australia throughout much of the 1990s and 2000s, Thereza Bazar eventually returned to London. In 2012, she released the single Hold Me On The Dance Floor as part of the pop act TnA Project, alongside singer Alan Connor.